In Search of the Top 10 Ag Blog Posts of 2013 - JP loves LIFE! In case you have missed it, the AgChat Foundation has an album of photos on its Facebook page. They are looking for the top 10 blog posts about agriculture this year. 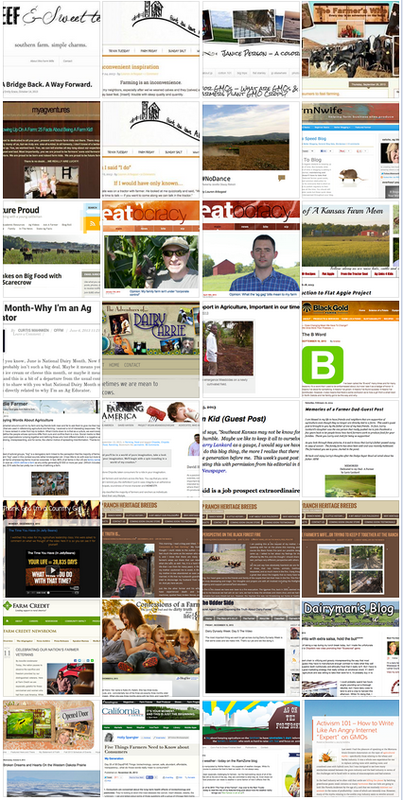 The blog posts in the set cover a wide range of topics, written by people in various parts of agriculture. I put the thumbnails from that album here as you see the varied blogs and in many cases, the bloggers themselves. When I look at the thumbnails from that album, I see lots of familiar faces. Lots of farmers I have met through social media and have later met at various events across the country. I also see new faces, bloggers I wasn’t familiar with and that I definitely needed to check out. Some are on everyday farming topics and others are on particular news stories. Emily Grace: A Bridge Back. A Way Forward. Ryan Bright:Dairy Dynasty Week: Day 5 The Video from Farmer Bright. Kelsey Pope:“Puppets of the weather – today on the RamZone blog”. Everyone of those blog posts has a personality and a story behind it. It will take you a while to really look through that list and think about a few you may want to vote into the Top 10 of the year. One of the posts that was part of my A to Z of agriculture — “G is for GMOs — What are GMOs & Why do farmers plant them?” is in the running. I thought I’d tell you about the background. This blog post was something that I had thought about writing for a long time but stayed away from. I talk about GMOs & biotech a lot at work and since this is my personal blog and the conversation has gotten so polarized on the topic, I hadn’t wanted to get into it here. That’s not the kind of blog I want. There are other blogs who do a great job of covering controversy and I just hadn’t wanted to draw lightning bolts in my direction. That changed. As I was doing my A to Z on Agriculture, I was asking people who read my blog what to write about. It seemed clear G was for GMOs for a lot of people. I decided I would write about it from the spot I sit in. GMOs are a really useful tool for some farmers. There isn’t just one kind of GMO and based on the background I have, I am comfortable with the safety of the products that include GMOs currently on the market. This post was the top post on my blog for a while. For months people continued to talk about it and share it through social media, so it was certainly my top post from a numbers game, but for me its top because I found a way to participate in the middle of a conversation that was polarized without adding to the polarization. The comments showed a real interest in hearing another viewpoint. So wander on over to the various blog posts above, give them a read. Then go the album on the AgChat Foundation page and simply click like to vote for the posts you think are best. If you think my post has a chance, give that photo a like. No matter who gets in the Top 10, I feel we are all winners for having found something that is important to us and taking the time to share our story & engage in conversations with others. What would happen if an organic farmer toured Monsanto? Thanks for taking the time to showcase the AgChat blog nominees! 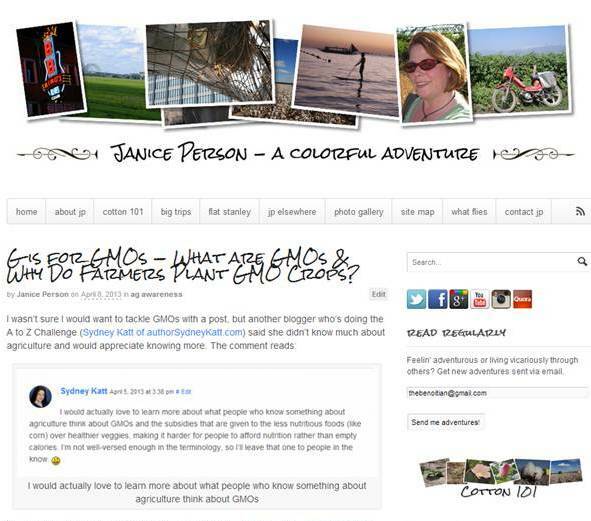 Your contribution of ‘G is for GMO’ is an amazing example of how we (as farmers) can connect in a real way with our neighbors and consumers! Thanks! Good luck! Love what you are doing too!